The seismograms for the magnitude determination exercise were recorded on an AS-1 seismograph. Additional technical assistance and a tutorial for the AmaSeis software can be found under the Help menu in AmaSeis. Teaching lessons that use AS-1 seismograms and AmaSeis can be found at: http://web.ics.purdue.edu/~braile/edumod/as1lessons/. http://neic.usgs.gov/neis/travel_times/. For instructions on downloading the seismograms to your computer and using AmaSeis to view and interpret the seismograms, see section 2.2 below. 2.1 Measuring S minus P times of the Seismograms (Paper copies, 20 minute records, Scale: 1 cm = 1 minute): Measure the S minus P times for the 4 seismograms below (Figure 1-4); then use the standard Earth travel time curves (examples are shown in Figures 5 and 6; for this exercise use the S minus P graph, Figure 7, which is plotted with the same time scale as the seismograms) to infer the distance (in degrees and kilometers) from the epicenter to the station; use Table 1 below to record your results. To find the distance corresponding to a given S minus P time, move the metric ruler along the S minus P travel time graph (keeping the ruler parallel with the time axis) until the S minus P time matches the time that you entered in the Table 1. The interpreted distance will then be the position of the ruler on the distance axis (in degrees) as illustrated in Figure 8. Because the S minus P times for the velocity structure that best match the Earth, increase consistently with distance, the observed S minus P time will only match the curves shown in Figure 7 at one position corresponding to a specific distance (the interpreted epicenter-to-station distance). Additional illustrations of this concept are shown in Figure 8 and 9 for a seismogram (in this case the KIP seismogram for the Oaxaca earthquake) plotted using the same time scale as the travel time curve graphs. 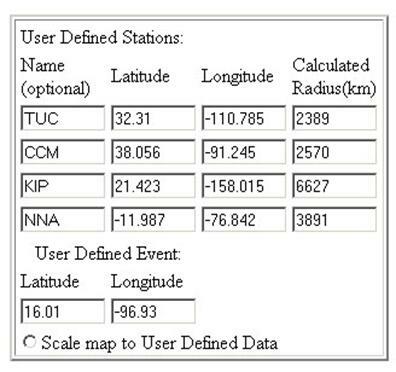 A map of the S minus P results (from Table 1) showing the calculated location of the earthquake (using triangularization) can be made using a globe (see section 3.1, below) or using the online IRIS DMC Event Search mapping tool (see section 3.2, below). Table 1. Data table for the S minus P earthquake location information. Figure 1. Oaxaca earthquake seismogram recorded at station TUC. 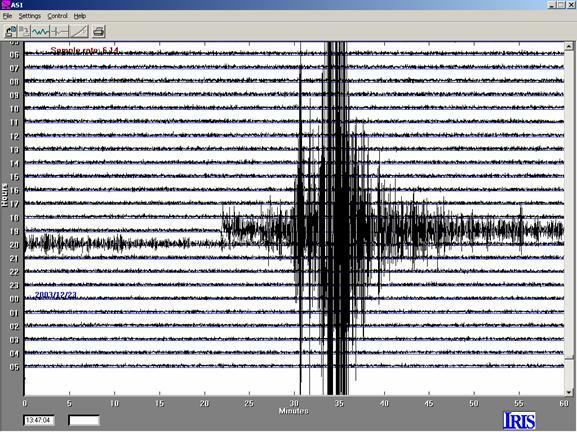 Seismogram displayed using the AmaSeis software. Time scale (if printed from the MS Word document) is 1 cm = 1 minute). Figure 2. Oaxaca earthquake seismogram recorded at station CCM. 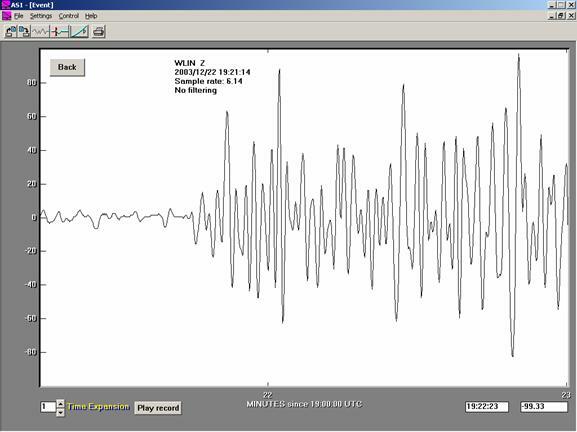 Seismogram displayed using the AmaSeis software. Time scale (if printed from the MS Word document) is 1 cm = 1 minute). Figure 3. 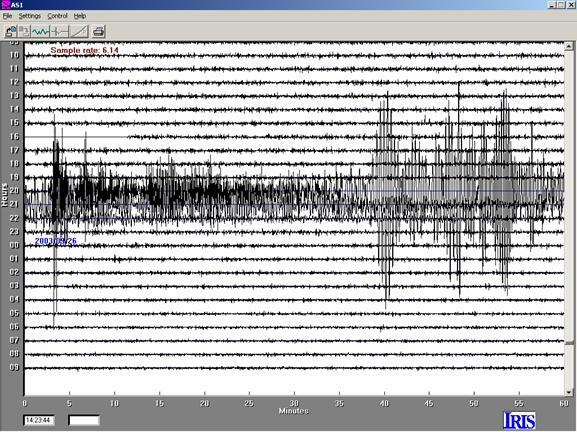 Oaxaca earthquake seismogram recorded at station NNA. 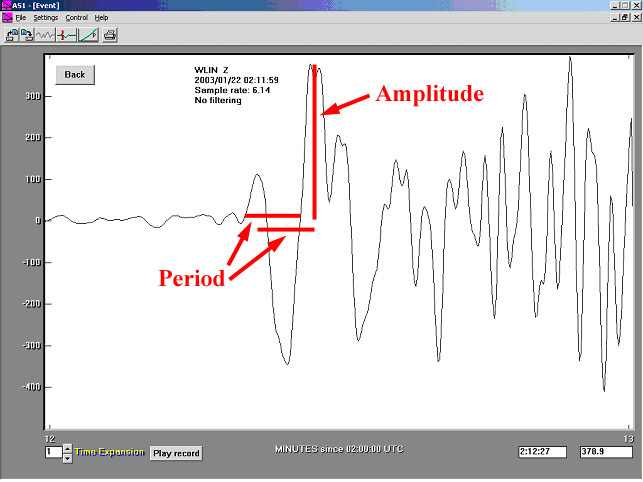 Seismogram displayed using the AmaSeis software. Time scale (if printed from the MS Word document) is 1 cm = 1 minute). Figure 4. Oaxaca earthquake seismogram recorded at station KIP. 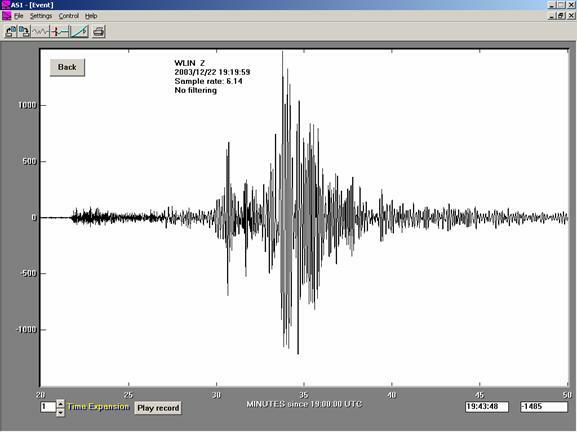 Seismogram displayed using the AmaSeis software. Time scale (if printed from the MS Word document) is 1 cm = 1 minute). Figure 5. 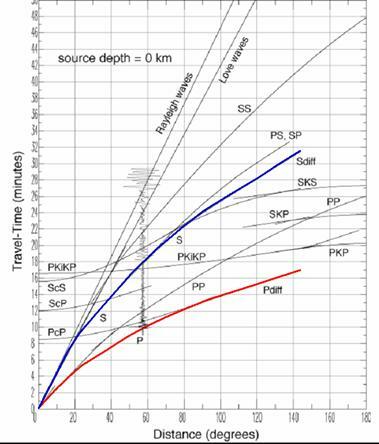 Standard Earth travel time curves for a source depth of 0 km (can be used for shallow earthquakes at distances of ~20 to 120 degrees). Travel times for many different phases (types of seismic waves and paths through the Earth) are shown. The first (or direct) P and S arrival times are shown by heavier lines. Note that the difference between the S and the P times increases smoothly with distance. Therefore, a seismogram with a given S minus P time will only match the travel time data at one specific distance. Figure 6. Simplified standard Earth travel time curves showing only the P and S times. Figure 7. 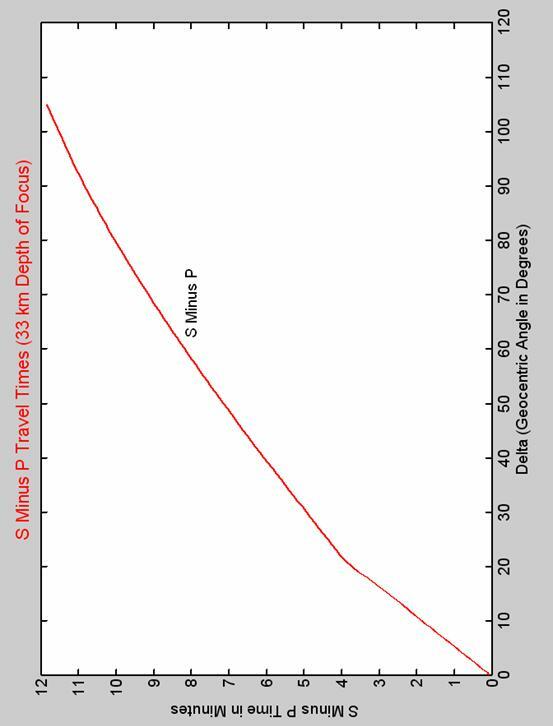 Simplified standard Earth travel time curves showing only the P and S times (the difference between the P and S times shown in Figure 6; time scale: 1 cm = 1 minute). 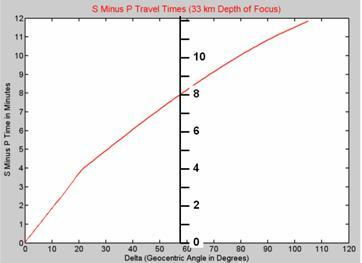 To find the distance corresponding to a given S minus P time, move the metric ruler along the S minus P travel time graph (keeping the ruler parallel with the time axis) until the S minus P time matches the time that you entered in the table for a given seismogram. The interpreted distance will then be the position of the ruler on the distance axis (in degrees). Figure 8. Illustration of ruler placed on S minus P travel times graph (Figure 7) showing position corresponding to 8 minutes (8 cm on the scaled seismograms and S minus P graph shown above) indicating that the epicenter-to-station distance for this seismogram is about 58 degrees. Figure 9. Overlaying a seismogram (the KIP seismogram, Figure 4; plotted using the same time scale as the underlying graph) on the standard Earth model travel time curves. Similar to the measurement illustrated in Figure9, this diagram shows that the S minus P arrival times indicate an epicenter-to-station distance of about 58 degrees. The AmaSeis travel time curve tool provides a similar display (Figure 10) although the graph is rotated so that the seismograms are plotted horizontally. Figure 10. KIP seismogram for the Oaxaca earthquake displayed in the AmaSeis travel time curves window. The seismogram is moved (by dragging with the mouse cursor) until the P and S arrival times match the travel time curves. The epicenter-to-station distance that corresponds to the interpreted S minus P times is displayed to the left of the seismogram. 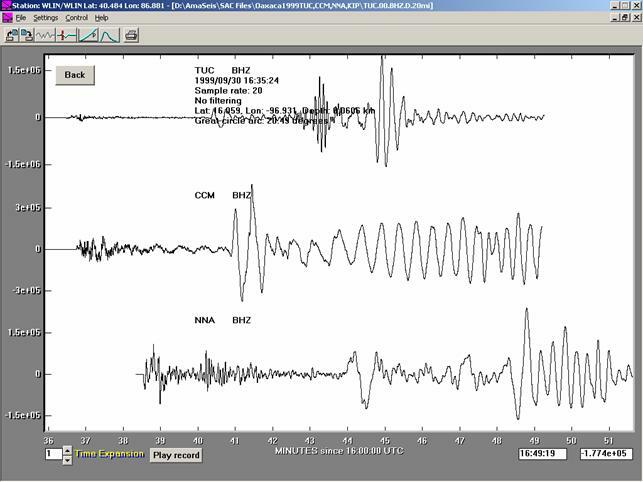 2.2 Seismograms (interpreted using AmaSeis): Sac-format seismograms can be downloaded from SpiNet or from the IRIS DMC using the WILBER II tool (see the “Using AmaSeis” tutorial referenced in section 1, above) and interpreted on your computer using the AmaSeis software to determine the S minus P times and corresponding epicenter-to-station distance for each seismogram. For this exercise, download the Oaxaca seismograms (shown in Figures 1-4) in Sac format by clicking on the file names in Table 2. Place the seismograms in a folder in your AmaSeis folder. 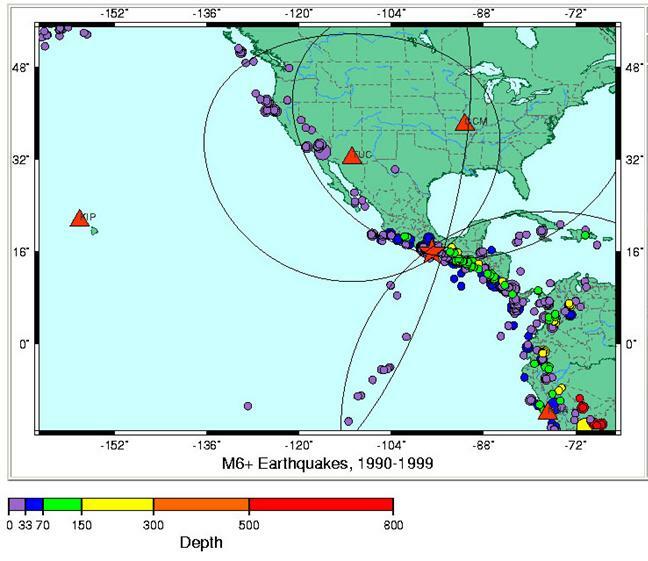 M7.5 September 30, 1999 Oaxaca, Mexico earthquake recorded at GSN stations CCM (Cathedral Caves, MO), TUC (Tucson, AZ), NNA (Nana, Peru), and KIP (Kipapa, HI) – click on the SAC files below to download . Use the AmaSeis program to open and view the seismograms. For each seismogram, use the Pick Arrivals tool to mark the arrival times of the P and S waves on the screen. (The P and S times can be measured individually by placing the mouse cursor on the interpreted arrival and reading the arrival time from the small arrival time window in the lower right hand corner of the screen. The difference between these times, the S minus P time, can then be calculated by subtraction.) Then select the Travel Times Curve tool and enter the depth of 33 km (a “standard” depth if the depth of the earthquake is not known) in the dialog box. The seismogram will appear on the screen (similar to Figure 10). 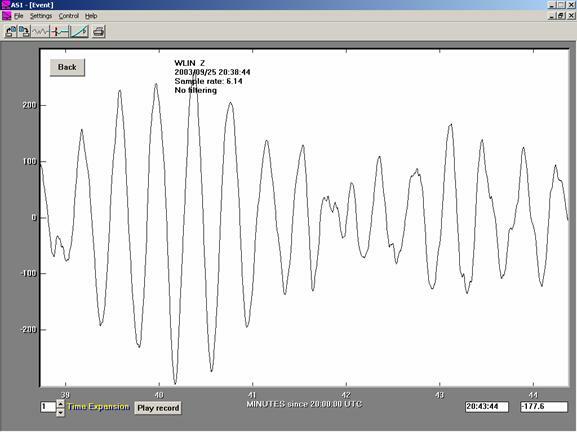 Move the seismogram by dragging with the mouse cursor until the P and S arrivals match the travel time curves (Figure 10). The epicenter-to-station distance corresponding to the S minus P time will be displayed to the left of the seismogram. Enter these data in Table 1. Further instructions for using AmaSeis in S minus P earthquake location are available in the “Using AmaSeis” tutorial referenced in section 1, above (see section 3.6 in the tutorial). Additional pre-assembled data sets for S minus P locations are also available in the Using AmaSeis tutorial (section 6). Using AmaSeis, three of the traces for the Oaxaca earthquake data se can be shown on one screen (using the same time scale) as illustrated in Figure 11. This display is useful for comparing the seismograms to observe how the arrivals spread out over time at greater distances, view the change in the S minus P times, and compare other characteristics of the seismograms. Figure 11. Three-trace seismogram display (stations TUC, CCM and NNA) for the Oaxaca earthquake data set. To display 2 or 3 traces using AmaSeis, hold down the Ctrl key while opening the SAC files to select more than one file name. To place the seismograms on the screen in the order that you want, select the seismogram to be placed in the middle first, then the one for the bottom and the one for the top. 3. Mapping the S minus P information: Two options for plotting the S minus P results from the Oaxaca earthquake on a map are described here. One option (section 3.1, below) uses a globe (inflatable plastic globes are inexpensive and convenient for this exercise; non-permanent marking felt pens can be used to draw circles and write on the globe). The other option uses the IRIS Event Search online mapping tool to plot the S minus P data (station and event locations and circles). Advantages of this option are accurate plotting, the ability to select a small map area, and the option to include historical earthquake epicenters from your selected area on the map. 3.1 S minus P mapping on a globe: The epicenter location can be determined from the S minus P data by drawing distance circles on a globe as illustrated in Figures 13-15. Use a line of longitude (Figure 13) to provide a distance scale (in degrees) to determine the length of the string corresponding to the epicenter-to-station distance for each seismogram. The distance in degrees (or angular distance or geocentric angle) is illustrated in Figure 12. The distance in km (along the surface) can be found by multiplying the distance in degrees by 111.19 km/degree. Draw a circle or part of a circle around each station (Figure 14) using the appropriate string length from your Table 1 data and the degree scale (Figure 13). The results should be similar to the map display shown in Figure 15. The circles should approximately intersect at a point. 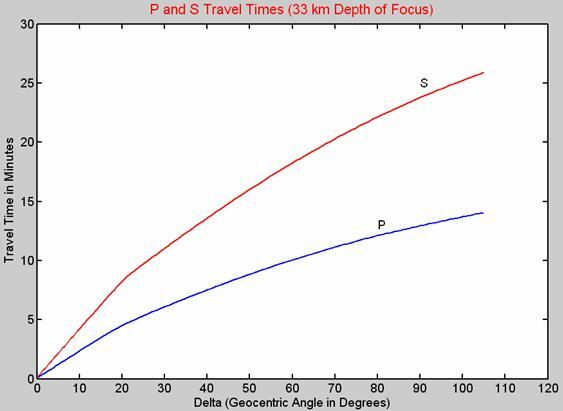 One can compare the S minus P determined epicenter with the “official” epicenter (calculated from arrival times from over a hundred seismograph stations) by plotting the official epicenter location on the globe (Figure 15). For the Oaxaca earthquake, the epicenter is reported as: 16.01 degrees North latitude, and 96.93 degrees W longitude. Figure 12. 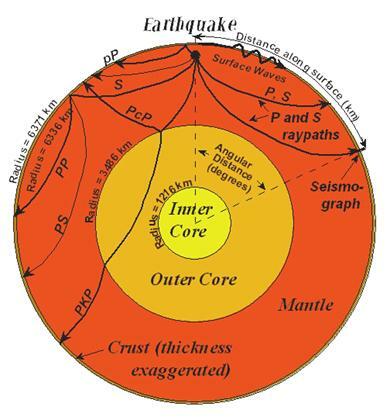 Cross section through the Earth showing the major spherical shells (layers; crust, mantle, outer core and inner core), selected raypaths of various seismic arrivals (phases), and the epicenter-to-station distance. Figure 13. Determining distance in degrees on a globe using the lines of latitude. The string is measured for a distance of 40 degrees in this illustration. Figure 14. Plotting an S minus P distance circle from a station. The length of the string is measured to the interpreted epicenter-to-station distance (in this case about 35 degrees) for station NNA (yellow dot) and an arc (circle or part of a circle) is drawn around the station. Figure 15. Results of S minus P location. The S minus P estimated earthquake epicenter is indicated by the intersections of the circles. Station locations are indicated by the yellow dots. The actual location is indicated by the red dot. http://www.iris.edu/quakes/eventSearchInstructions.htm. The user-defined data are entered in the Event Search map window illustrated in Figure 16. The following data are derived from the 4 seismograms for the September 30, 1999 Oaxaca earthquake. Using the IRIS Event Search tool to produce a map of historical seismicity and entering the optional data shown in Figure 16, a map of the earthquake location derived from the S minus P times is produced from the online tool (Figure 17). In the User-Defined Stations window, enter the locations of the stations (given below) and “official” epicenter (optional) and the epicenter-to-station distances (in km) inferred from the S minus P times for the 4 seismograms for the Oaxaca earthquake. Also, enter the map location parameters provided below. Selecting Make Map will result in a new map with the S minus P data (similar to Figure 17). Station coordinates (degrees latitude, degrees longitude): CCM: 38.056, -91.245; TUC: 32.310, -110.785; NNA: -11.987, -76.842; KIP: 21.423, -158.015. Earthquake epicenter (degrees latitude, degrees longitude): 16.01, -96.93. Suggested map area (latitude and longitude range, in degrees; for IRIS Event Search and S minus P location map): -15 to 55, -165 to -65. Figure 16. User-defined data entered into the IRIS DMC Event Search mapping tool. Figure 17. Example of S minus P location map created with the IRIS DMC Event Search mapping tool. Before entering the optional user-defined data (Figure 16), an earthquake search was performed to find the epicenters of events of magnitude 6 and above that occurred in the map area from January 1, 1990 to December 31, 1999. Circles show the epicenter-to-station distances interpreted from the S minus P times for each station. The circles approximately intersect at a point indicating the epicenter. The “official” epicenter calculated from seismograms recorded at over one hundred stations is shown by the red star. More information about the Event Search mapping tool is provided at: http://web.ics.purdue.edu/~braile/edumod/eqdata/eqdata.htm (see section 2.3). 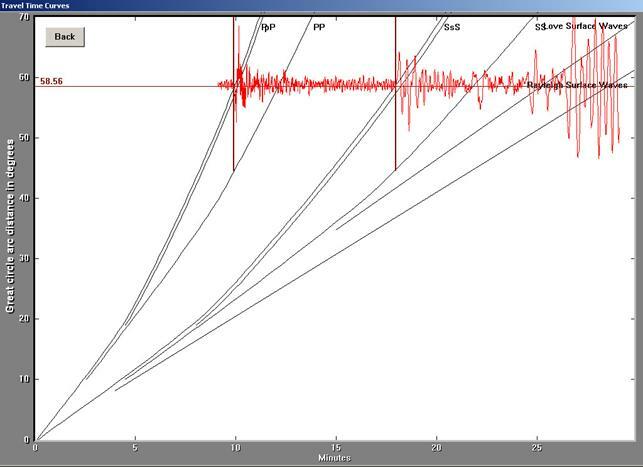 Measure the amplitude and period of the P wave (mb magnitude determination; maximum amplitude in the first ~15 s of the seismogram using the enlarged record; an example of measuring the amplitude and the period is given in Figure 18) for the San Simeon earthquake (Figures 19-21). Measure the amplitude and period of the ~20 s period surface waves for the Hokkaido earthquake (Figures 22-24) to determine the MS magnitude. Use Table 3 to record your data. The magnitudes are calculated using the online tool MagCalc (using the amplitude, period and epicentral distance information given recorded in Table 3; MagCalc includes standard magnitude formulas). Table 3. Data table for the mb and MS magnitude calculations. Figure 18. 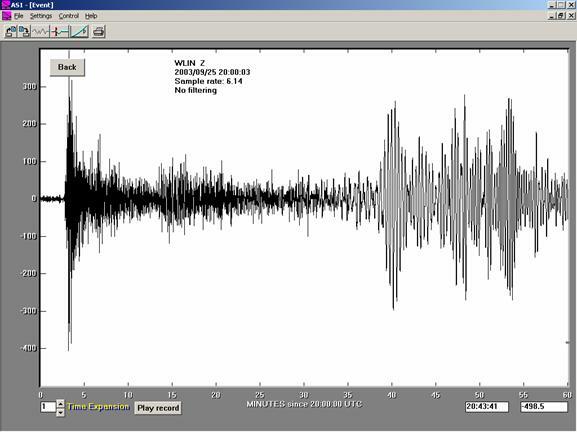 Example of amplitude and wave period measurement for a seismogram (M7.8 Colima, Mexico earthquake, January 22, 2003) displayed using the AmaSeis software. The view has been “zoomed in” by selecting (extracting) a small time duration to view the first (P) arrival. The time scale (horizontal scale) shows one minute of the seismogram. The vertical scale is relative amplitude in digital units or counts. The vertical bar illustrates the amplitude measurement for this arrival and indicates an amplitude of about 380 digital units. The horizontal bars show two approaches to measuring the approximate period of the wave arrival. The upper bar is drawn between 3 successive zero crossings of the signal defining approximately one cycle of the wave motion (similar to one cycle of a sine wave). The lower bar is drawn between two successive peaks (or troughs) of the signal, also defining approximately one cycle of the wave motion. For both methods, the measurements (length of the bars in seconds) indicate that the approximate period of the wave motion is 5 seconds. Figure 19. AmaSeis 24-hour screen display showing the December 22, 2003 M6.5 San Simeon, California earthquake recorded at AS-1 station WLIN. Figure 20. AmaSeis event screen (extracted seismogram) display showing the December 22, 2003 M6.5 San Simeon earthquake recorded at AS-1 station WLIN. Figure 21. Enlarged (“zoomed in”) seismogram from Figure 20 showing the first (P) arrivals. Amplitude scale on the left is in digital units or counts. Figure 22. AmaSeis 24-hour screen display showing the September 25, 2003 M8.3 Hokkaido, Japan earthquake recorded at AS-1 station WLIN. Figure 23. AmaSeis event screen (extracted seismogram) display showing the September 25, 2003 M8.3 Hokkaido earthquake recorded at AS-1 station WLIN. Figure 24. Enlarged (“zoomed in”) seismogram from Figure 23 showing the surface wave arrivals (~20 second period Rayleigh waves). Amplitude scale on the left is in digital units or counts. The web page for this document is: http://web.ics.purdue.edu/~braile/edumod/as1lessons/EQlocation/EQlocation.htm. Funding for this development provided by IRIS and the National Science Foundation. ã Copyright 2004. L. Braile. Permission granted for reproduction for non-commercial uses.